My line of work entails many community “events”. Each of these events often includes some sort of branded t-shirt. I only need so many t-shirts, so I am always looking for ways to up-cycle them. That’s why, when I saw this pin on Pinterest, I knew I had to give it a shot. But, there were no instructions. So, I’ve spent some time experimenting, and I’ve been very pleased with the results. I thought I would share! Old t-shirts, in as many colors as you desire. Old belt buckle, brooch pin, necklace pendant or any other sort of bobble you might want to add. Assemble your materials. For this tutorial I’ve gathered 3 different colored t-shirts, and one belt I picked up at a thrift store. 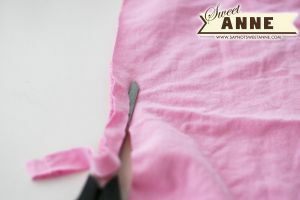 Cut the hemline off of the first shirt. Discard. 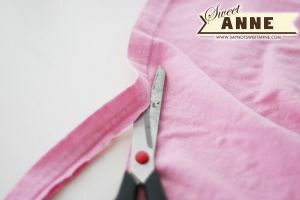 Cut a 1/2 inch strip from the same shirt. Repeat with the other two shirts. Your loops will look like this. 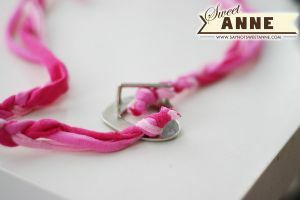 Cut more if you would like a bulkier necklace. My cats seem to really enjoy this part. 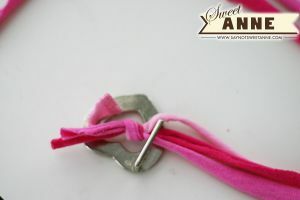 Take the first loop, and stretch it out so that the knit fabric curls and becomes thinner-looking. Repeat with the other strips. Your loops will now look like this. Again, much to the delight of my cats. Now, cut all of the loops into strings the same length. Don’t try and estimate the necklace length yet- we’ll do that after the braiding. 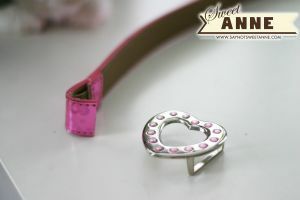 Now, collect whatever charm you will use on your necklace. I removed that adorable heart belt buckle for use in my design. begin by braiding about a 4inch section of the necklace. Then, allow another 4-6 inches without braiding. 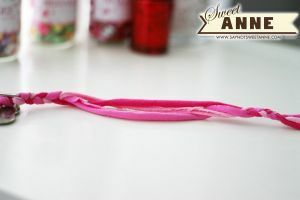 When you begin your second 4inch braided section, make sure the braid begins in a different configuration than the last one ended. 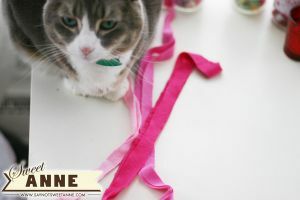 That is, if you last braid strings came out (left to right) *pink, darkpink, red* you would start your new braid with the strings in a different order such as: *red, pink, darkpink*. This keeps the braids separate, instead of just becoming one big one. Finally, secure the end of the necklace to the beginning. In my case, I tied another knot around the belt buckle. 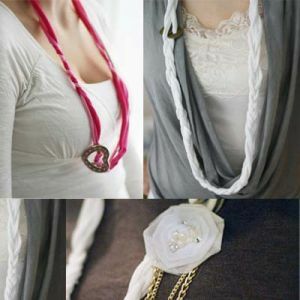 I think these necklaces are super cute/casual for everyday wear. I’ve gotten several comments on the white one with the coin detail. Not to mention they would be awesome at a slumber party! They are definitely easy enough for kids to make. Imagine the possibilities! Awesome ideas, Kayla. This might even be something I do with my 4th grade students as a gift they can give on valentines day to their moms, friends, sisters, etc. Super cute! Thanks for sharing, Sweet Anne! I’m so glad you like them! I really did have a great time putting them together. With some large wooden beads, these could be awesome kid’s projects! Awesome tutorial! Your cats are SO cute. I love this…have seen them around, but like you, couldn’t find a good tutorial! Thank you! I pinned you! I love it! I could always use more necklace choices! Lovely, as always, Kayla! Thanks for the great tutorial and for sharing at Shine on Fridays!